The latest sponsorship at Southern Cross station? IKEA seat covers. 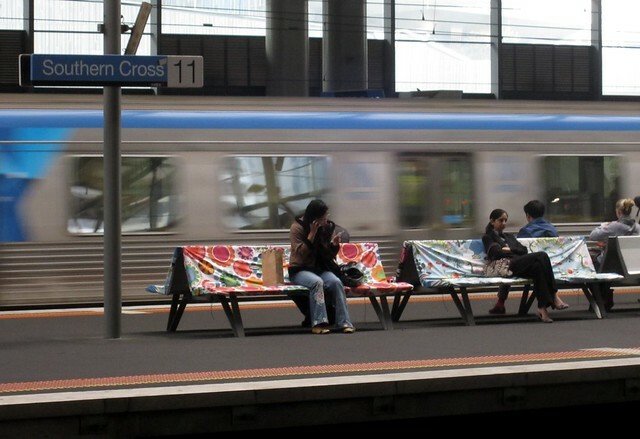 Observed at Southern Cross Station this week: IKEA seat covers. They seem to be confined to platforms 11 and 12, though if you’re trying to get to IKEA by public transport, platform 9 (train to North Richmond, then a tram) is probably a better bet. Not every seat has them, and there are no cushions underneath the covers — just bare metal. Maybe I missed it, but I didn’t spot any specific posters or signage for IKEA, apart from the logo. At least it’s not potentially misleading like the Red Rooster destination screens, or blocking useful information like the ads at the Bourke Street entrance — or indeed blocking your way in and out of the station. Is it the first of April?? Who gets the money for these sponsorship deals? The company that owns Southern Cross? I saw those from a distance the other day, and thought they were a variant on yarn bombing. I’m more cheezed-off by advertisements on metal screens covering the windows of buses and trams – making it much harder to read street names on unfamiliar routes especially at night. The benches in stations are reasonably clean. 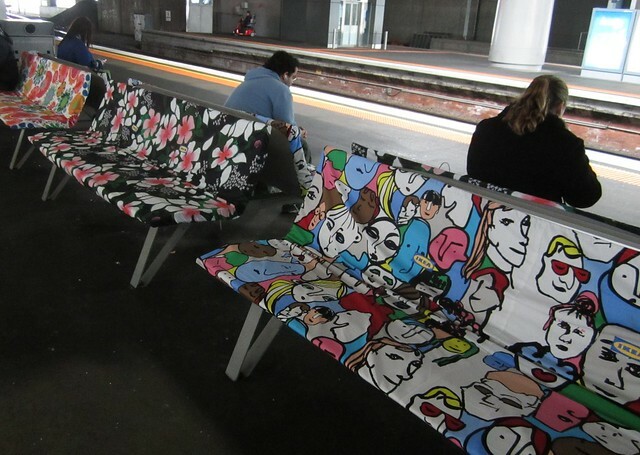 These covers would be more useful to cover some of the filthy stained cloth seats on the trains.